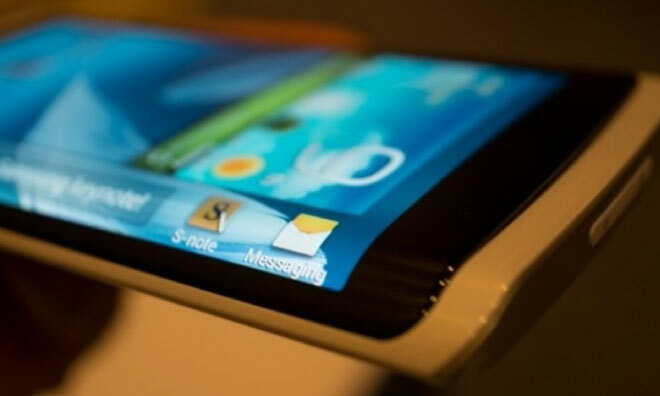 Samsung is said to be developing a new device for launch in 2014 with a flexible display that envelops the device's edges, allowing users to read messages when the device's main display is at a non-viewable angle. The three-sided display will be manufactured using a new iteration of Samsung's proprietary Youm OLED displays, according to a new report published Friday by Bloomberg. The publication's sources were mum on a release date, but intimated that it could hit shelves as soon as the second half of 2014. Samsung showed off a prototype of such a device during the company's keynote address at January's CES trade show in Las Vegas, where they also introduced the display technology that is said to form the foundation of the new smartphone. Youm is a flexible OLED technology that uses plastic, rather than glass, as a substrate for the display's transistors. Samsung has said that the current generation of 5.7-inch Youm panels— which many believe power the company's recent Korea-only Galaxy Round smartphone —are just 0.12 millimeters thick. Curved displays are a growing trend in smartphones, but it remains to be seen whether the trend is here to say. So far, only companies that also have a manufacturing interest in flexible display technology— namely Korean conglomerates Samsung and LG— have released devices with the feature, and even then only in the companies' home market of South Korea. Apple is also said to be exploring devices with curved glass displays, but the technology's real future may lay with wearable devices like Apple's rumored "iWatch," which many believe will make use of flexible displays to wrap around users' wrists.